The area of product costing has been traditionally divided into two techniques, job costing (sometimes called job order costing) and process costing. The concepts behind job costing vs. process costing show that they have similar cost flows. The first is used for production based on the receipt of a somewhat unique job order with specifications from the customer. The second term is used for the production of homogenous units with identical characteristics that are the result of raw materials going through a continuous process. Job costing is well suited to construction companies that perform work based on contracts and manufacturing operations that produce goods in batches based on a specific job order. The costs of each contract or production order are easily assigned to the units being produced whether they are homes or batches of plastic products. The cost flow of direct costs (direct materials and direct labor) and indirect costs (overhead) are easily traced and assigned to individual Work In Process accounts for each job. The completed product(s) for the job is entered into a Finished Goods account and upon sale goes into a Cost of Goods Sold account. Process costing is typically used for manufacturers that continually produce a product of identical units that is accumulated in an inventory. Sales orders have no special product specifications. They are withdrawn from the Finished Goods Inventory and shipped to customers. A candy bar company that produces and sells just one line of candy bar wouldn’t accept an order for a specially produced one using the same product name, which would be similar to the way orders are accepted in job costing. 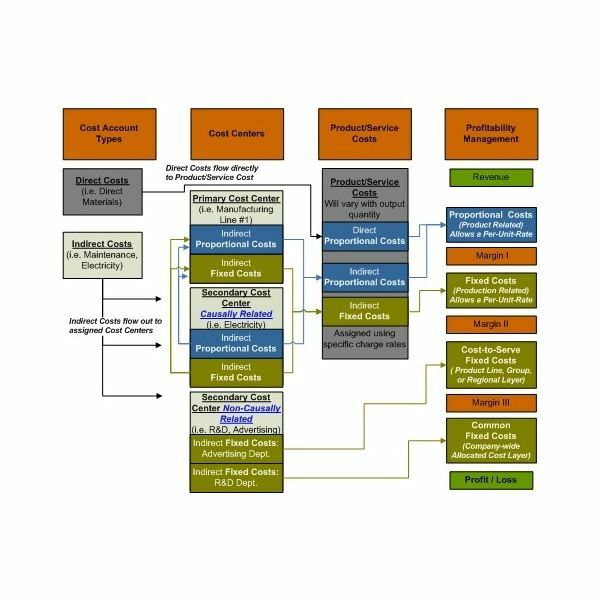 The cost flows of process costing follow the exact same order as that of job costing, but the direct costs and factory overhead are harder to match to the units of continuous production. Instead of costs being matched to jobs they are matched to the Work In Process accounts of each production department with each department being a process in its own right within the overall production scheme. They are just transferred from one department to another in procession until the products are completed and become inventory, recorded in the Finished Goods account. Some jobs are only going to be partially completed at the end of an accounting period for job costing, and, most certainly, partially completed processes in each of the production departments for process costing. The costs of unfinished products in job costing are carried on the balance sheet in the Work In Process account, and the costs of completed products are in the Finished Goods account. The costs of finished goods that are sold are not expensed until the day of the sale by being entered into the Cost of Goods Sold account. This may not happen until the next accounting period; this would be the next year for many companies. The continuous process of process costing presents a concept that is not part of job order costing. It is the idea of an "equivalent unit." An equivalent unit is used to determine how much of the partially completed production in the Work In Process accounts for each production department can be expressed in terms of completed units. The production departments all have partial amounts of direct materials, direct labor, and factory overhead in their Work In Process accounts at the end of an accounting period, and these are reconciled on a worksheet to arrive at a cost per equivalent unit. Once the costs per equivalent units are determined they are added to the period production for that department as part of the ending balance. The sum of the ending balances in the Work In Process accounts for all the departments becomes the balance for the Work In Process account on the balance sheet. Knowing the difference between job costing vs. process costing is important when determining what kind of product costing system a company should be using, especially in a new small company where one person might be handling the accounting duties. Hiring a professional accountant as a consultant might be the logical choice. Accounting for Management.com, Product Cost vs. Period Cost, at https://www.accountingformanagement.com/product_costs_and_period_costs.htm.